At Back Office Pro (BOP), we quickly and efficiently create accurate transcripts and then convert those transcripts into attractive and professionally-rendered subtitles. If you are facing a period of influx or a skill shortage, and are looking for subtitling companies in India, we can assist. At BOP, we have over a decade of back office experience and full knowledge of the standards and formats required to create any multimedia experience. 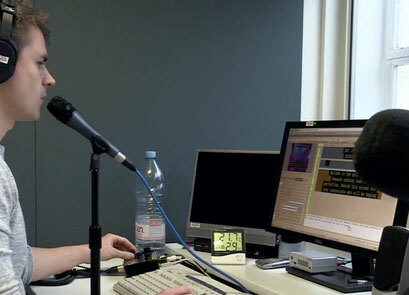 Irrespective of your location our subtitling back office support can be used for most kinds of media. To outsource subtitling back office support, call or email BOP today. Closed Captioning Services At BOP, we offer closed audio and video subtitling and captioning services in many foreign languages. Our services include everything from translation to caption encoding. Multiple reviews ensure accurate synchronization of text with video. Open Captioning/Burned-in Captioning We offer permanent film and video captions through open captions in a video or film - useful for those with hearing disabilities. Here the video is shorter as compared to a closed caption that requires a separate text file and video. Source Script Transcription If you do not provide us with a written script, we transcribe from the received audio file, resend back for approval, and then translate the transcribed document into the target language. Integration Post-translation, we re-translate the text back into the source language. Next, the caption translation in the target language is included in the movie to sync accurately with the dialogue. Translate into Any Format: BOP translates audio, video and other multimedia formats into various formats, including paper transcripts, subtitles/captions, voice-overs, MP3, WAV, RA, WMA, MP4, GSM, WMV and more. Expand Customer Reach: Whatever your multimedia is, whatever its purpose and main targets, sub-titling can expand its potential audience and make it work harder for you. Expand your customer base with cost-effective subtitling services. Call us today to discuss what sub-titling can do for your project, and what Back Office Pro can do for your company. Write us your requirements and get a free quote within one business day.